Gen Con has been billed as the “best four days in gaming”, but is it really? Having never been to one before, I envisioned massive crowds of smelly people zombie shuffling past communist Russia sized lines of consumers waiting to buy games. Just the thought of that filled me with dread. The way that Gen Con had been described to me was as one massive orgiastic buying frenzy with very little room or time for any kind of open gaming. That didn’t sound particularly appealing to me either. 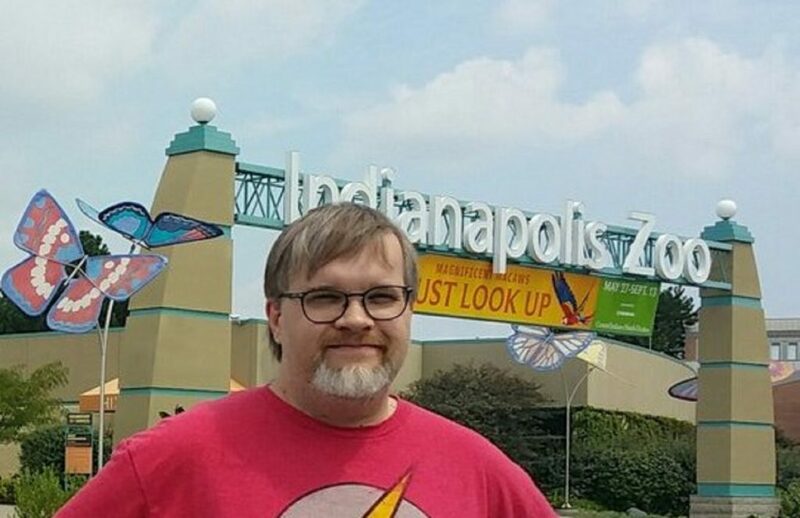 So it was that we set out for Indianapolis, filled with doubt and pretty certain that this would be our only GenCon ever. While our initial intention was to get up at some ridiculous time so that we could arrive in Indianapolis as soon as humanly possible, the desire to sleep won out and Jennifer and I didn’t get up until 7 or 8 in the morning. We’d gotten everything packed the night before so it wasn’t long before we were kissing all of our animals goodbye and trying to sneak out of the door so that our dog wouldn’t realize that we were about to disappear for several days and lose his mind. We failed. He lost his mind. So it was with a guilty conscience that we began our journey. Our destination: the Indianapolis Zoo and then onward to Gen Con. The drive was pretty uneventful unless you count the escapades of the guys in the Adventure Zone podcast recommended to me by some of my fellow writers. Before we knew it, we were in Indianapolis and saying hello to our very first manatee. We also got to watch some bears fighting and some orangutans being unbelievably silly. Eventually the zoo closed and they gave us the boot, but by then It was time to check into the hotel anyway. That’s when the clock really started ticking. Checked in, unpacked, and freshened up, it was officially starting. Our first stop: Giordano’s pizza in downtown Indianapolis with the other guys from Meeple Mountain. We’d compared our various scheduled events previously and very few of us had any overlap. We knew that this would be perhaps the only time that we could get together and celebrate as a team for the entirety of the weekend. The pizza was amazing and the company was even better. After dining out, we made our way down to the convention center with the rest of the crew to pick up one of the program books. That mission was a total failure, but Jennifer and I did manage to find a couple of coupons hidden around the convention center that we could trade in for free copies of The Chameleon by Big Potato Games. It was getting late so, still excited by the prospect of scoring a free game, we headed back to our hotel and went to sleep. Gen Con was about to begin. If you want to grab a program, get it early in the day. They go fast! Look around the convention center the night before. There are hidden treasures and freebies hidden all over the place. When it comes to sleep before a big event, it seems like my intentions and my reality are never quite in sync. I’d intended to sleep in until 7 or so, but I was up at 6; nervous, excited, anxious… I was ready to get the day started and also kind of dreading it. After getting ready and downing some coffee, we flagged down an Uber and were on our way. Our first stop of the day was at Mayfair Games HQ where we were scheduled to play Barenpark at 9 A.M.
Thankfully we’d arrived 20 minutes early, which allowed us to watch a few ‘how to’ videos while we waited. That meant we weren’t completely unprepared when it came time to play the game. When that time did arrive, we played a 3 person game with a really cool guy named William who had flown all the way down there from Maryland. They must have a lot of bear parks up there because he defeated us twice in a row. Jennifer gave him a run for his money, but my score was embarrassingly low. 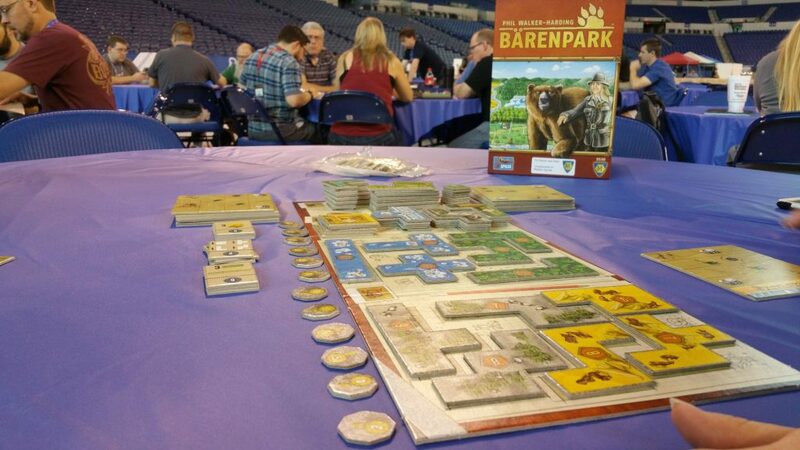 Overall, though, I really enjoyed Barenpark and wouldn’t mind owning it someday. From there we headed over to the exhibit hall to take care of some various pieces of business including picking up a prize I’d won in a Northstar Games contest, claiming our copies of The Chameleon, and picking up a Con Carrier bag from Everything Epic Games. Also just wanted to look around and try to take it all in… and boy was there a lot of it. When we went to play Photosynthesis (where we met another husband and wife couple named Brad and Elissa), everything changed. Photosynthesis was an absolutely brilliant game. Jennifer and I had been eyeing Kingdomino for a while and after being informed that purchasing Photosynthesis along with Kingdomino would get us a discount on the total purchase, we knew we needed to get it. And, well… things sort of got out of control after that. Ha! Just look at this picture and you’ll see what I mean. All of that fit into the Con Carrier bag, by the way, with room to spare. I won’t tell you it wasn’t freaking heavy, though. That would be lying. After what felt like an eternity of walking around listening to my shoulders complaining, we decided it was time to call it a day and head back to the hotel for a bit to offload our newly acquired loot and to freshen up before the They Might Be Giants concert. Having done all of that, we made our way back to the hotel where, unsurprisingly, sleep came easily. Friday was coming and it was scheduled to be our busiest day yet. We paid money to play Barenpark ahead of time, but this turned out to not have been necessary. We could have simply walked in there and asked to play it at any time and just paid for it then. Unbeknownst to us, they don’t actually teach you the games at the Mayfair events. They just hand it to you and tell you to have fun. There are few things more pleasant in life than being able to celebrate your spouse’s birthday with them in a way that is special and significant. Friday was such a day, but it started out rather poorly. After waking up and getting ready for the big day ahead of us, we made our way downstairs to flag down an Uber so that we could get to our first scheduled event. And then everything started going sideways. For whatever reason, the Uber app decided that it didn’t like our credit card anymore, so a lot of time was wasted trying to get that sorted out. What had begun as an early start began to slowly trickle away until it slipped into late start territory. In the middle of that, I received a text message from a friend that only served to add onto the pressure. You see, several months ago when Jennifer and I filled out our wish list for Gen Con events, there was really only one game that she was excited to play and, of course, that didn’t happen. The slots filled up very quickly and we missed our chance which really saddened Jennifer. That’s when I went into action. Unbeknownst to her, I sneakily paid a friend to order the game in question for her so that I could surprise her with it on her birthday. The text that I received was from him. He was at the convention center with the heavy game and some tee-shirts we had ordered trying to find me. Like me, he was anxious to get to wherever he was going. Our carefully coordinated plan was failing because of my stupid credit card. The day, it seemed, was ruined before it even had a chance to get started. Then, like a shining beacon in the darkness, the hotel’s doorman appeared and informed us that a shuttle bus was on the way to ferry all of us con-goers down to the convention center. Needless to say, this was a godsend. The ride into town was actually quite enjoyable. 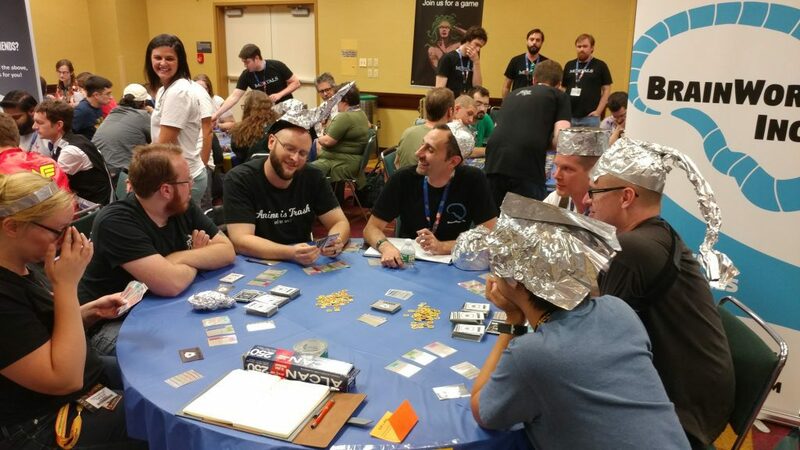 We met a couple of guys from Canada who were dressed in silver lamé pants and tinfoil hats who were here to show off their game they’d created called ‘Cardspiracy’ which is a card game about putting together random things to create conspiracies in order to draw the most readers to your blog. Those guys were awesome and I decided right then and there that I needed to go take a look at their game at some point before Gen Con came to a close. Eventually, we arrived at the convention center where we piled out of the car, shook hands with each other, and went our separate ways. Jennifer and I hoofed it over to Mayfair HQ. By this time, we were already 20 minutes late. Jennifer decided to go ahead and learn the rules for the game while I split off to go “pick up our tee shirts” from my friend (the one who had texted me earlier). It took me a bit to find him. When I did, the exchange went off without a hitch. I crammed her game into my backpack and then put the shirts on top of it and practically ran back to Mayfair’s set up. When I finally arrived, she and I grabbed a copy of Murano and got down to the serious business of playing the game. While we were getting set up, I kept commenting about how well the tee shirts had come out in the hopes that she would open my backpack and actually look at them. After what seemed like an eternity, she finally got curious enough to look inside. At first she didn’t see her gift, but when she finally discovered her copy of Trickerion in there, her eyes lit up and a great big smile overtook her face. My birthday mission was accomplished and it was a rolicking success! 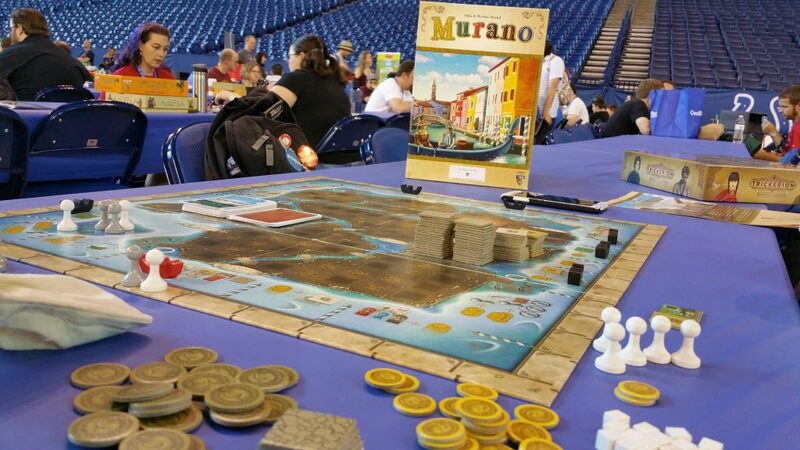 Murano was a really good game, but we didn’t get to finish it because our next event was scheduled to begin soon. After turning in the game, we rushed over to the convention center and found our table and sat down to play our very first game ever of My Village. That’s where we met Kent who’d driven there from Kansas City, Kansas. My Village was a very enjoyable game. I want it even though I felt like I did rather poorly at it. Ultimately it was a face off between Kent and Jennifer, and Jennifer was the victor, by two or three points. We didn’t have a lot of time to celebrate her victory, though, because we had things to do and people to see – literally. Just as my game of My Village was coming to an end, I received a text from a person who I’d won Trajan off of in an auction. So, we met up with him and picked it up. Then it was off to the exhibit hall to browse the booths some more. Since it was her birthday, Jennifer got to decide where we were going. As it turned out, we were going everywhere and yet nowhere in particular. We threaded up and down the various rows and corridors stopping occasionally to pluck up a free button or to study something that had caught her eye. At some point, we wound up at Genius Games’s booth where I finally got to meet and shake hands with John Coveyou where he talked to me about their upcoming game Subatomic. 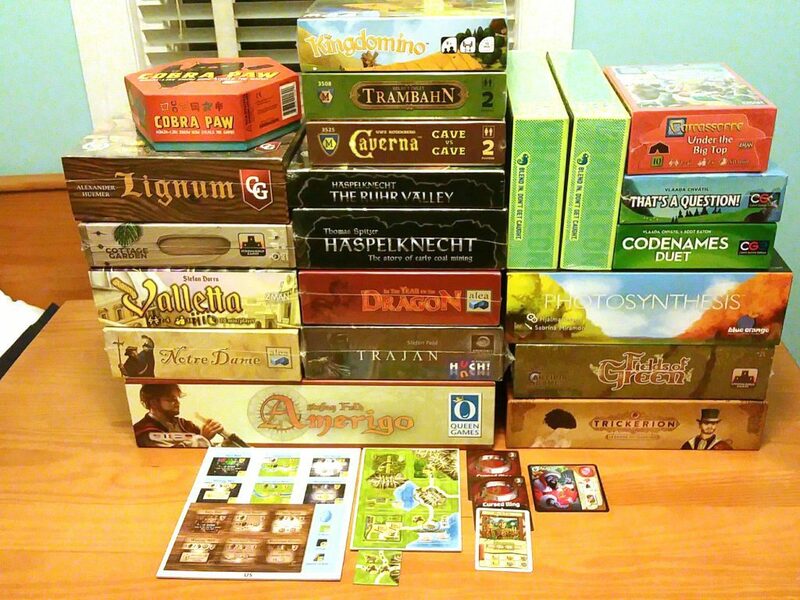 Somewhere along the way, we acquired a few promos for various games that we already owned – Caverna, Glass Road, Five Tribes, Roll Player, Imperial Settlers, and Isle of Skye – which I couldn’t wait to get home and squirrel away in their various boxes! Even as we did this, the clock was ticking on our next event and we eventually had to peel ourselves away. Next up was Fields of Green by Stronghold Games where we met Nick and Curt who were visiting from Wisconsin. Fields of Green was a fabulous game. For me, it scratched the itch that 7 Wonders scratches, but it did it in a much more elegant way. Given the option between the two, I’d rather play Fields of Green. Our next event was scheduled at 8, but Jennifer and I opted to just skip it and go get some dinner somewhere to celebrate her birthday. We wound up at St. Elmo’s. The food was delicious, but it was extravagant both in size and price. It was definitely not cheap, and their portions are massive. It wasn’t long before I realized I’d eaten too much. My post-dinner discomfort put the kibosh on any other gaming plans we might have had, so it was that we traveled back to the hotel and called it a night. Friday was over and Saturday promised to be just as busy. Study the Convention hall map beforehand if you want to save yourself a ton of walking. As it turns out, the gaming halls are directly connected to the exhibit hall. All this time we’d been exiting the exhibit hall and walking this massive, complete circuit around the convention center to get to the gaming halls when we could have just stepped through the doorway ten feet away if we’d known any better. Make sure you budget for food wisely. The restaurants surrounding the convention center can be very pricey. Gen Con Day 3 began on a much better note than the previous day. Our first event started at 10 o’clock and we managed to get there in time. The game was Lorenzo il Magnifico by CMON. We were surprised to find out that we were going to be playing with Kent again (apparently we share similar interests when it comes to board gaming). The chances of signing up for the exact same game with a total stranger in a convention of over 65,000 people is pretty low, but there we were. While I got beaten pretty badly and wasn’t feeling too good about the game, the passage of time helped heal the wound a bit and I quickly warmed up to the idea of adding the game to my collection. The fact that Jennifer really enjoyed the game helped, too. Lorenzo il Magnifico finished pretty early and we found ourselves with some time to burn, so we decided that since we’d already gotten two of the ribbons for Mayfair Games’s ribbon quest by happenstance, we might as well try to get the rest of them; if not for the 50% discount off of a game purchase, then for the completionist aspect of the thing. 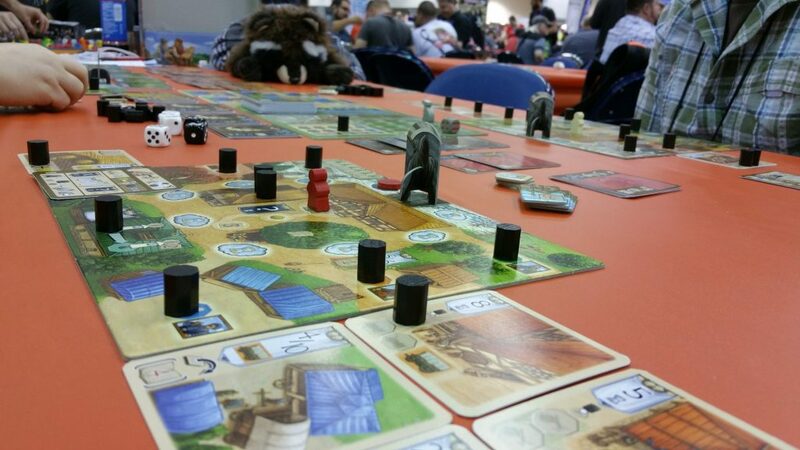 We knew that Mayfair Games was going to have a gathering from 8 P.M. to midnight and that as long as we got our Sheep ribbon from demoing things, that we could pretty readily pick up the rest at the gathering. It went even better than we thought. 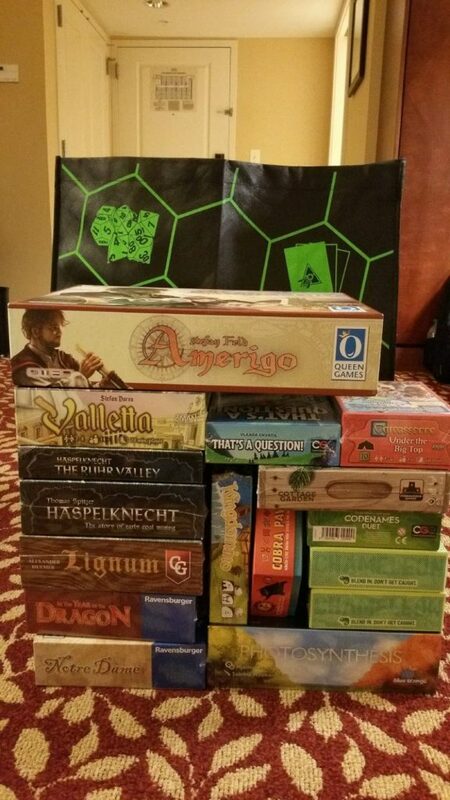 The demos were lightning fast and we were able to get way more ribbons than we’d anticipated and we wound up picking up both Trambahn and Caverna: Cave vs. Cave while we there at a 50% discount on each. We managed this feat just in time, too, because it was 3:00 and time for us to rush off to our next event – Roll Player: Monsters and Minions. I’m not going to lie. THIS was the event I had been the most excited about ever since I’d signed up for it months previously. I think Roll Player is absolutely brilliant and I was itching to get a chance to play the expansion. Getting to meet Keith Matejka and play the game with him was just an awesome bonus. He was a very cool, very chill guy and I had an amazing time. That expansion is everything that I hoped it would be and more. We finished Roll Player: Monsters and Minions and Jennifer and I headed out to get some dinner. After our dinner, we made our way back to the convention center so that we could go to the play testing hall. I really wanted to meet up with the people we’d met on the car ride the previous morning. Their play testing was going well and they’d received a ton of feedback. I really wanted to give the game a try, but there just wasn’t enough time. Gen Con is like a eurogame in that regard. There’s always a ton of things that you want to do, but there’s just not enough time to do it all. After some aimless wandering and looking around, we headed to Mayfair HQ to resume our quest. 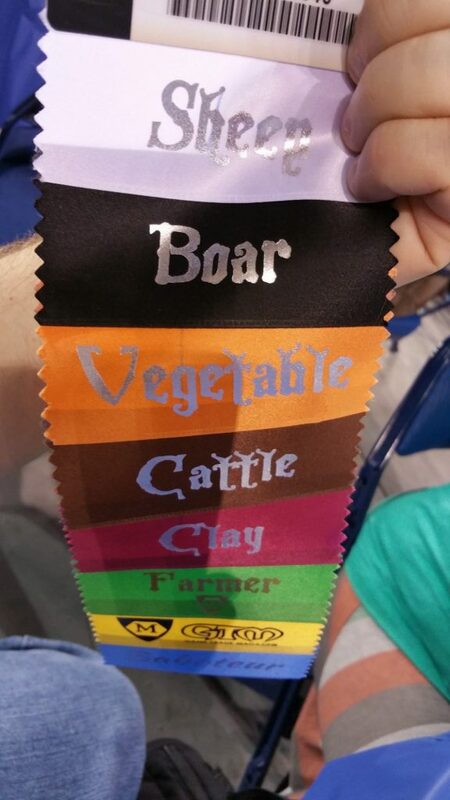 It took us a few hours, but we managed to finally complete all of the tasks necessary for us to snag our last few ribbons. Then we headed back to our hotel where we packed up our stuff in anticipation of leaving the next morning. If you’re at Gen Con and you find yourself in urgent need of a restroom, then head upstairs. The difference in the wait is night and day. Downstairs is pure pandemonium. Upstairs is peace and tranquility. While it is poorly advertised, the Mayfair Games ribbon quest is apparently a thing that happens every year. Gathering your ribbons at the free demos and the low cost late night gatherings is a great way to try out some awesome games, earn free loot, and save a ton of money on your purchases. Knowing this, Jennifer and I will likely not schedule anything at all in the future. Free (or relatively free) gaming opportunities abound. This was not something that we were aware of months before when we’d signed up for a ton of events. If you miss an event that you paid money for, some other events will accept your paid tickets. The open gaming library is a good example of this. For the cost of a couple of generic tickets per person (about $4 total), you can go into their area and check out and play games to your heart’s content as long as you don’t leave. 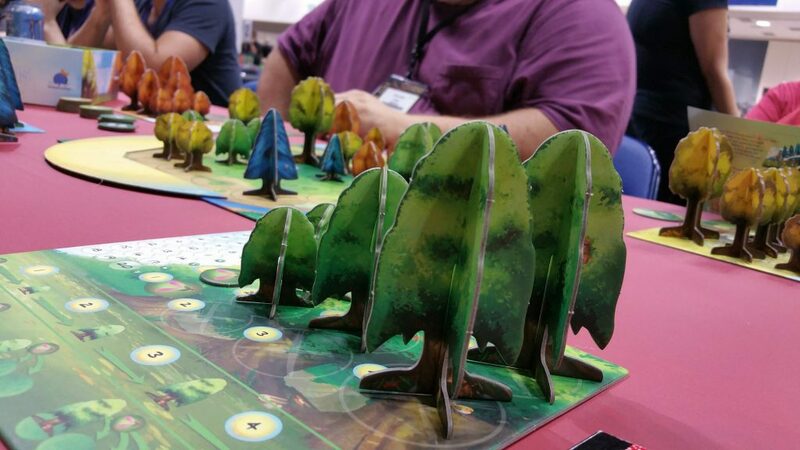 If Gen Con, for you, is all about trying out and playing games that you’ve never played before (or maybe just playing the ones you love with people you’ve never met) then you will definitely want to keep this in mind. They receive a portion of the funds that you wasted on those missed events and it enables them to grow their library even more. So, there I was… the very last day of my very first Gen Con. After loading up the car and getting the hotel room sorted out, Jennifer and I drove into town and found ourselves a place to park. We had signed up for an 8 A.M. “Learn How to Knit” class and we were both really looking forward to it. It didn’t take long, though, before I realized a hard truth. Knitting is painful. The constant looking down at my hands coupled with the limited range of movement started up a throbbing symphony of pain in my back and shoulders. I started off strong, but things started going south pretty fast. I suspect that it wasn’t the knitting itself so much as it was the residual effects of lugging around bags full of games over the previous three days. Whatever the reason, my attempts at learning knitting came to an end almost as soon as they began. It was fun while it lasted, though. Once the knitting class was finished, Jennifer and I headed over to the exhibit hall to pick up our last ribbon from the Mayfair booth. That’s when she and I realized that we had nothing to do until Mayfair did their raffle drawing at 2 P.M. We had discovered earlier that there is a button collecting aspect of Gen Con that we hadn’t previously been aware of, so we went into full on button hunting mode. Typically, the buttons are for kids only, but from 3 P.M. onward each day, anybody can walk up and simply collect a button. There were 11 locations in all with unique buttons. The challenge was to collect at least 10 and then head over to an information booth to receive a reward of a larger button. If we’d known about it earlier, we’d have collected all 11 of them, but we were only to make it out of there with 10 of them and the large button. That button hunt was ridiculously fun and I wish I’d known about it from day one. 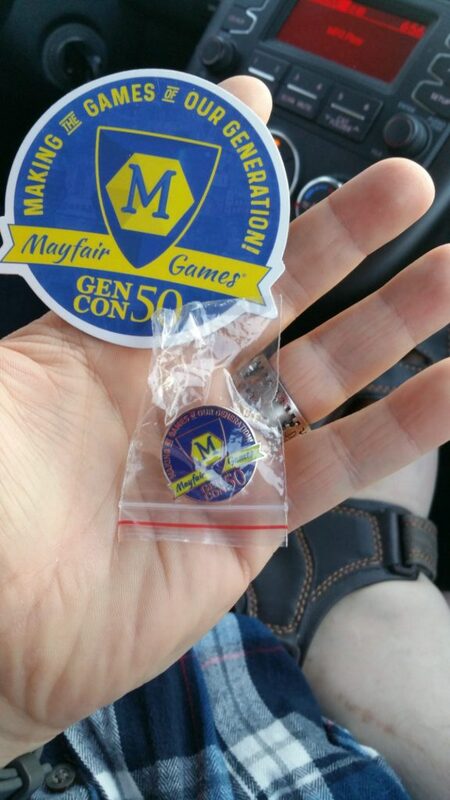 It’s a good thing we did it, too, because the only thing we got from the Mayfair raffle were a couple of refrigerator magnets and some cool Mayfair pins that celebrated Gen Con 50. We toyed with the idea of trying to track down the 11th button, but ultimately decided that it was time to go home. If you’re planning on trying your hand at something artsy and crafty, do it on day one. In addition to the button event, there were lots of other fun, item collecting events – a perfect way to keep both the kids and the adults occupied! And just like that, my first Gen Con came to an end. It was a fun, exhilarating weekend and if I’d had doubts about the experience when I began, those doubts had been assuaged by the end of it all. Games were played. Connections were made. Friendships were strengthened. Gen Con isn’t about getting the latest and greatest things. It’s about getting together with the gamer family you didn’t know you had and simply enjoying being in one another’s presence. It’s like Jolt Cola for the board gaming soul. It was my first Gen Con, but it certainly won’t be the last.